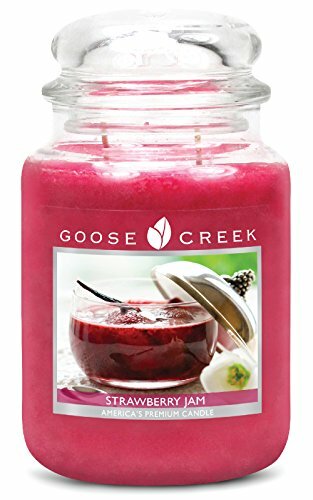 These premium jar candles are highly scented and are available in beautiful colors that complement any room's decor and a double wick design that allows for hours of clean, even burning. With several unique smells to choose from, all our candles are made in the USA with only the finest quality ingredients. Our candles are safe and non-toxic. See images for more details. UNIQUE DESIGNER FRAGRANCES are highly scented and include Peanut Butter Sugar, Citrus Lavender, Vanilla Pumpkin Waffle, Orange Berry Slush, Sweet Honeysuckle and more. LONG BURNING DOUBLE WICK designed to quickly fill the entire room with rich fragrance and burn evenly. Burn time is 120-150 hours! UNMATCHED VALUE AND DESIGN With bright vibrant colors and specially formulated scents at terrific value, you'll love us compared other leading, more expensive brands. MADE TO BE THE BEST: Goose Creek Candles are all poured in the USA with the highest quality ingredients available. SAFE AND NON-TOXIC for hours of clean, invigorating fragrances with no smoky residue.